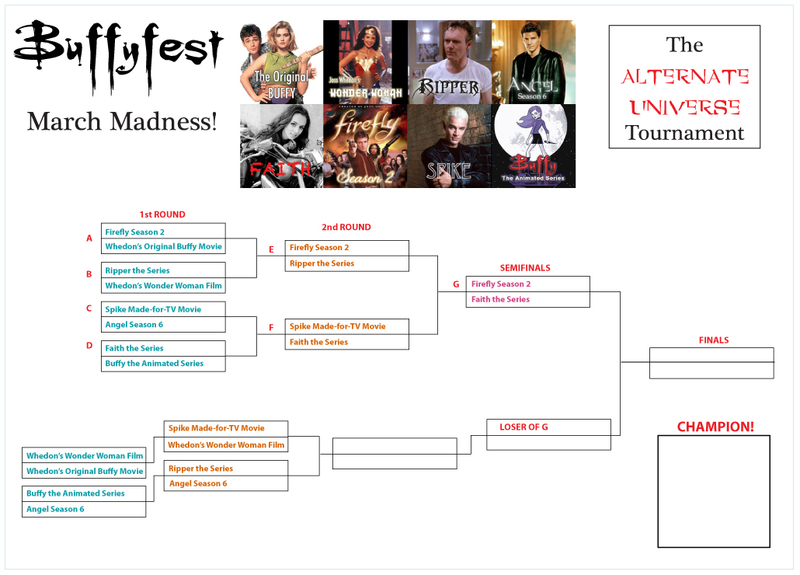 Buffyfest: March Madness! The Whedon Alternate Universe Tourney - Loser's Round 2! March Madness! The Whedon Alternate Universe Tourney - Loser's Round 2! We're about halfway through March Madness! Of course, our goal in this tourney has been to find out which of Joss Whedon's fallen projects would be most desired in a Magical Alternate Universe of fun. 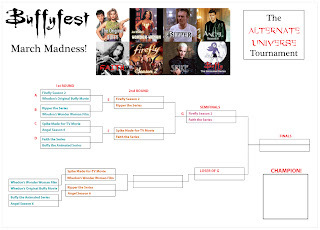 The road so far has been an interesting one, with Spike the TV Movie, Ripper, Wonder Woman, The Buffy Animated Series, Angel S.6 and Whedon's vision for the original Buffy film all in the loser's bracket at the moment! Of course, some of them can still make a come back with this being a Double Elimination Tournament...but Buffy Animated and the OG Buffy are out for good. Buffy projects are taking a hit here. -Firefly S.2 beat Ripper. I know this was a very tough one for a lot of people, but we got through it. -In a shocking twist, Faith the Series narrowly beat a Spike Made-for-TV Movie! Spoike! Spike vs. Wonder Woman? - I'm not sure what to make of this. They are entirely different projects, so I guess it all depends on what you'd like to see come to fruition more. I think I have a small idea about what's going to win and quite frankly, I'm shocked that this particular vampire with a soul is even in this area of the tournament! Ripper vs. Angel Season 6 - Ah, Rupert Giles vs. the vampire who killed him. Well when you put it like that! Sheesh. just peeked at the upcoming semi-finals slot G, and i can now say with dignity that i totally bleeping hate you so much. no joke. all vamps all day this round:) - even tho I'm a comic nerd lol. Hamstap! This tournament has you unusually hostile...haha. I'm SHOCKED that Angel beat Ripper. WTF? The votes are all over the place!